Balloon twisting and sculpture is a fun busking activity often done at carnivals and street-fairs by clowns and entertainers. 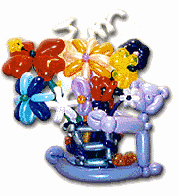 Professional balloon artists know all the secrets twisting balloons into simple objects, animals, famous characters, and complex sculptures. These busker balloonatics are busy creating amazing multi-balloon sculptures including an airplane, baseball hat, cobra, crocodile, duck, dog, flying mouse, flying fish, whale, starfish, fox, hippo, Martian, monkey, and Bart Simpson. There's even an an ice cream sundae made from silver, pink, white, and red balloons. The next time you see a busker twisting beautiful balloon sculptures, rest assured they're a seasoned professional enhancing their performance skills with many years of experience behind them.